For Recommended Ages 3+. Your child will be delighted by this busy band set. 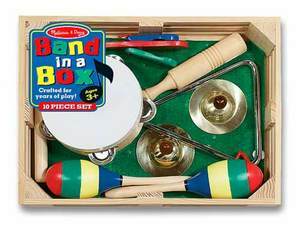 It includes a tambourine, cymbals, maracas, clacker, tone blocks and a triangle. the box measures 15" x 11" x 3.5"